It’s that time of year again – time for Rio Grande to roll out its latest expansion for the best-selling phenomenon that is Dominion. 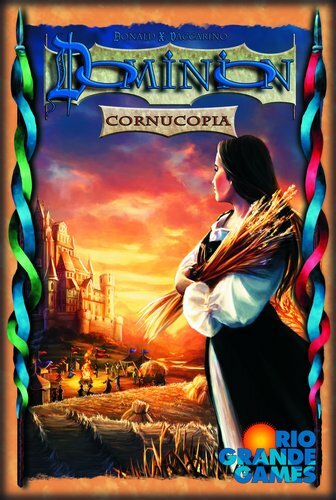 This time, it’s Cornucopia, a small expansion along the lines of last year’s Alchemy. The box comes with 13 new kingdom card sets, as well as 5 prize cards that can be acquired. 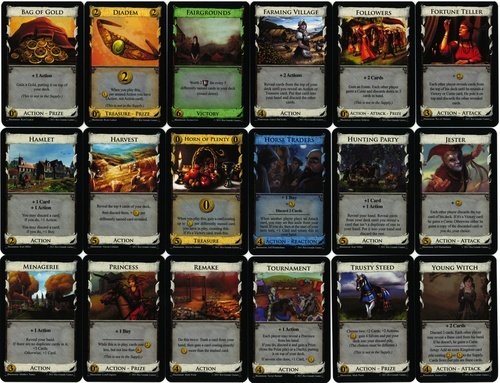 Each expansion so far has had something new to bring to the table when playing: Intrigue added interest to the game by adding lots of cards with choices to be made; Seaside brought in tokens for use with specific cards and introduced duration cards, which had lasting effects; Alchemy brought potions into play, a new treasure that was required for certain cards to be available; Prosperity upped the money and the stakes. Cornucopia’s main idea seems to center around encouraging variety in play. I’m excited about this because that seems to fit my style of play. I’m always interested in finding out good combinations of cards, and it sometimes frustrates me when people just focus on one thing to purchase every turn. It always seems to work for them too, and that makes me even crazier. Fairgrounds (cost 6) – This is a kingdom card worth victory points, much like the Gardens in the base set in that its value is dependent on a certain set of conditions. The Fairgrounds is worth 2 points for every 5 differently named cards you have in your deck (rounded down). This means that if if every card in a typical game was in your deck (Copper, Silver, Gold, Estate, Duchy, Province, Curse, and one of each of the ten kingdom cards), you’d get 6 points for each Fairgrounds. Using colonies and platinum from Prosperity takes the total up more. Add some extra cards from the Black Market, Tournament, or Young Witch, and it could go higher. I love playing with a Gardens strategy, so this is another similar concept I look forward to exploring. Farming Village (cost 4) – This card gives you two more actions and allows you to reveal cards until you come across a treasure or action card. The original Village gave you two actions and a card as well, but that card could be a victory card or curse that wouldn’t help you, so this one seems a bit better. It still feels like something I’ve seen before. I guess they can’t all be big winners. Fortune Teller (cost 3) – This is an attack card that gives you two extra dollars to spend and forces the other players to draw until they get a victory or curse card, which then goes on top of their deck. This seems a bit like the Bureaucrat, though the victory card comes out of the deck instead of your hand. It could also serve to make the opponent discard some cards that may or may not be helpful to them. Hamlet (cost 2) – This one gives you a card and an action. You can also discard a card for another action, or discard a card for another buy, or discard two cards for both. It seems like this one could be used in some interesting ways, but I’m not seeing them yet. Harvest (cost 5) – For this one, you’re harvesting the top four cards of your deck (drawing and discarding them). You get one dollar to spend per differently named card. This is another one that encourages variety – the more different things you have, the more chances you have to make it worth more. Of course, you run the risk of discarding some cards that would be helpful to you, so I’m not sure I’d be going after this one. It would be worth at least one, and no more than four, but depending on your card distribution, it could be worth it. Horn of Plenty (cost 5) – This is a treasure card that has a base value of 0 coin. However, you can use this card to gain another card costing up to one coin per differently named card you have in play. The catch is that you have to trash the Horn of Plenty if you get a victory card with its power. It doesn’t count as an extra buy, or an action. However, it’s probably a good thing to have if you have multiple buys – I know I’m frequently upset when I have $1 leftover with multiple buys. Having this card should offset that. Horse Traders (cost 4) – This is the reaction card for this expansion, meaning it has effects when someone else plays an action. Its base power is that you get an extra buy and three extra dollars to spend, but you also must discard two cards. The reaction is that you’re able to reveal the card from your hand and set it aside when someone else plays an attack card. It doesn’t protect you like the Moat, but it gives you an extra card and goes back into your hand at the start of your next turn. Sounds interesting. It seems like a nice way to get a free card, but the reaction will only help for one turn. Hunting Party (cost 5) – You get an extra card and an extra action. In addition, you reveal your hand and start drawing cards until you get one that isn’t a duplicate of one in your hand. That one goes into your hand, and the rest get discarded. So basically, you get two extra cards and an extra action. I don’t know if this one is that great – it that it might be pretty easy to get a victory card in your hand. It seems like the Laboratory with a little more flexibility in getting one of the cards. Jester (cost 5) – Another attack, and this one is kind of nasty. You get two dollars to spend. Also, the other players discard the first card from their deck. If it’s a victory card, they gain a Curse. Otherwise, either they get a duplicate of that card OR YOU DO. You can’t gain a copy of the victory cards, which is probably a good thing – if you could grab a free Colony out of this one, it would completely break the game. I’m eager to bust this one out on some people. Menagerie (cost 3) – You get an extra action. If you then reveal a hand with no duplicates, you gain three extra cards. If there are duplicates, you only get one. It seems like a nice tie in to the theme, rewarding variety. This sounds like the type of card I’d like to have, particularly with the possibility for three cards to get that second action. Remake (cost 4) – A variation on the Remodel card. Trash a card and gain a card costing exactly one more. You get to do this twice. I never really have been able to figure out the best way to use the Remodel card, and this one seems like it will likewise befuddle me. It would be a good way to get Coppers out of your hand (gaining nothing in exchange) or upgrading your Estates to more profitable cards. Tournament (cost 4) – You get an action. Then, every player (including you) may reveal a Province from their hand. Each player who reveals a Province can gain a Prize or a Duchy (if there are any left), which goes on top of your deck. If none of your opponents reveal a Province, you get to draw a card and an extra dollar to spend. Prizes include the Bag of Gold (+1 action and a Gold for the top of your deck); the Diadem (a treasure valued at 2 coin, plus one for each action you have but didn’t use); Followers (+2 cards, gain an Estate, everyone else gains a Curse and discards down to three cards);the Princess (+1 buy and makes cards cost 2 coin less); and the Trusty Steed (you can take two of these actions: +2 cards, +2 actions, +2 coin to spend, or gain 4 Silvers and discard your deck). The Tournament seems like it might be pretty valuable particularly if you can get a Province long before anyone else. The Prizes seem like they will be great to have. Young Witch (cost 4) – This is like the Witch, except seemingly less powerful. You get two cards, but you also must discard two cards. Each other player must then gain a Curse if they don’t have a Bane card. Bane cards are an extra supply set of kingdom cards costing 2 or 3 coin (essentially an eleventh kingdom pile) that can be used as protection against the Young Witch. I think you can still use the power of the cards. It seems that I would rather have the Witch…but I guess that’s why this one costs one less to buy. So there you have it. Is it necessary? Probably not. Do I still want it? Yep. It just adds more spice and variety to the game, and that’s a good thing. Hope you enjoyed this completely uninformed analysis – if anyone has played the expansion and wants to weigh in on some of their favorite cards, feel free to comment! Thanks for reading!